FYI: Yesterday the Quebec government announced a ban on registration of RHD vehicles. Please note that by virtue of a ministerial order, the Minister of Transportation will prohibit access to public roads for road vehicles with a driver's cab on the right, because they pose a risk to users of the road on our roads. The ban comes into force on 29 April 2009, for a period of 180 days. Vehicles with a driver's cab on the right, covered by the ban are imported vehicles whose year of manufacture is 15 years or more. As these vehicles are subjected to mechanical inspection at the first registration application, the mechanical inspection agents who intercept from 29 April. Indeed, they agree to perform a mechanical inspection if the vehicle is allowed to access public roads (see, are granted access to public roads below), if any mechanical inspection will be made. Since under the procedures, you must require a certificate of mechanical inspection line when the first registration allowing traffic on public roads and that the mechanical inspection agent will refuse to carry out the investigation for these vehicles no registration to access will not be issued (certificate of temporary registration plate or allowing traffic on public roads). The only registration will be permitted without use (Sutil) as laid down in procedures and to use "off road". We remind you that the generality 2.07.020.E (appendix) provides a certificate of mechanical inspection line should be required to issue a temporary registration certificate for a vehicle from outside Quebec.  road vehicles belonging to a driving school or an institution which is licensed to teach driving of heavy trucks, issued under Article 10 of the Act respecting private education. Traders will be informed by letter that as of 29 April 2009, they can not issue a temporary certificate or affix a removable plate on a vehicle with a driving position to the right unless it is registered to the system before April 29 2009. The Ministerial Decree specifies that all interested parties may send comments to the Société de l'assurance automobile du Quebec, 333, boulevard Jean-Lesage, C-4-21, CP 19600, Québec (Québec) G1K 8J6 within 90 days its publication in the Gazette officielle du Québec. The Company will continue its work on this issue during the period of 180 days. Upon expiry of this deadline, it will submit a recommendation to the Minister regarding the advisability of making the ban permanent. Oh, that's not good. What can we do to help out from the west coast and make sure this doesn't spread to other provinces? I never thought one day I'd be ashame to be from Quebec. I'll be entering Quebec on the following day, won't cause me any issue as I'm registered out of province but I'll be parking my Delica at my brother's place for the summer and the insurance will be expired by the time I take her back. I was instructed by ICBC to obtain a Quebec temporary licence to drive back home in October. I wonder if it will then become an issue. And wonder why it's a 180 days ban? "If it ain't broken, modify it!" temporary license to drive it back WILL be a problem. 180 day ban to "test"... after that it WILL become permanent unless WE as the import community DO something. Delicat. you CAN do something, get your brother to mail his elected representative at the Quebec National Assembly and demand they stand up for our rights! Everyone in Quebec should do the same. Everyone should also stay tuned on IVOAC for more information. Vehicle: 91 Exceed Crystal Lite. Holy Crap! What a load of BS. Quebec likes to make it very hard to even have a used vehicle on the road. I was toying with importing more delicas here to montreal.... guess that's a washout. I'd like to know if there is any evidence that supports the notion that RHD vehicles are more dangerous to drive in Canada. Doesn't seem so. It's looks like the few lonely Delicas on Quebec roads are destined to stay a rarity, and that is a real shame. Looks like the Psychidelica wont get much company any time soon. I'm writing my local Representative.... In French! I'd like to know if there is any evidence that supports the notion that RHD vehicles are more dangerous to drive in Canada. Doesn't seem so. ICBC relesed a study a while back stating that RHD was 40% more likely to be involved in a collision, the authors later backed away from it when it was proved that their study was complete garbage... however it was never officially countered publicly, and is part of the ammunition that Quebec is using. It seems however that Quebec did a study that actually proved RHD to be SAFER than LHD, however they aren't publicizing it. We are currently doing a FOIP request for it. Unlike the rest of the provinces, Quebec is based on "civil law". The rest of the provinces are based on "common law". Common law is based on precedence, civil law is based upon agreed upon rules. I am not a lawyer but I believe this information can help. Know your rights. Canada is a wonderful place ~ let's not lose her. To start with: Read the Canadian Charter Of Rights & Freedoms; it enhances the Canadian Bill Of Rights; The Constitution Of Canada and the British North America Act II, in that order. We are lucky to have this community ~ share the knowledge and practice your dialectic skills. 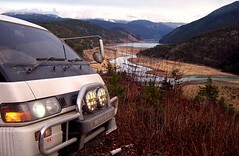 It is one thing to know the path; it is another thing to drive the path in your Delica. Part of the 'problem' with this temporary ban is that at the end of it Quebec will be able to point to the lack of accidents involving RHD vehicles and say, "See, there were no accidents with those 'unsafe' vehicles." Of course, the initial logic for their argument is all backwards, once again: 15+ year-old-vehicles are not as safe as current vehicles, so let's change the rules so only OLDER vehicles will be allowed, and then there will be less incidents. IMHO, the only way to counter this thinking is to petition the powers that be to change the import laws to allow NEWER vehicles (say 5 years) into the country, not older ones. I fully appreciate the reasoning for the import restriction is a protectionist measure for our own auto industry, but when our own auto industry is in the toilet (because they won't build vehicles we want to buy), we should be able to purchase vehicles that are available, with a selection we like, at a price we're willing to pay. It reminds me of what my grandfather used to say: "Back in my day, you could have any flavour of ice cream you wanted, as long as it was vanilla." As far as the selection of NAPOS is concerned, is it any wonder no-one likes vanilla any more? ...hmmm, I wonder how they would account for my 20+ year accident-free driving record? I can't belive it , what a load of $%&^%$#^%&^& !! of all the provinces in this country, quebec would as been my last pick to impliment such a rule!! lucky me I dont plan on going back to live there........................ever! lucky me I dont plan on going back to live there........................ever! Don't think it will stop there, if they get away with it you can pretty much guarantee that every other province will follow suit! Thats exactly what I thought too! I'm very surprised to hear that. Green1 is right I fear, Let's do what we can to prevent this actually catching on with the other provinces. The thing I'm worried about is I don't seem to hear about legislation like this until it's too late and already being implimented (sp). phunka wrote: Green1 is right I fear, Let's do what we can to prevent this actually catching on with the other provinces. The thing I'm worried about is I don't seem to hear about legislation like this until it's too late and already being implimented (sp). Nobody heard about this one, that's one of the worst things, they did it with less than 1 day's notice! For people who give a damn, there are a couple avenues. This site http://www.alertejdm.com/ to coordinate the Quebec protest has just been launched. If you spent your high school french classes leafing through the French mags at the back of the class, there is always google translator. Another avenue is toi keep up todate on the response of JDM owners across Canada via http://forum.ivoac.ca/. here is the translated version of that french site, the translated link should work.